Outlined below are the specific tasks Core Contractors provide as a part of our standard agreement to comply with the Mandatory Wood Frame Soft-Story Seismic Retrofit Program. 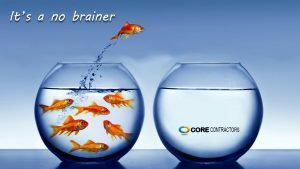 Combined with our low price guarantee, a 30 day construction completion guarantee, and available financing, the decision to move from frustrated and confused to Core Contractors is simply a no brainer. Core Contractors will visit your building with experienced personnel to provide you with an immediate solution and an all inclusive, lump sum price for the required scope. This is not an estimate or an initial cost of engineering. This is the first and last number for the entire scope. Core Contractors in-house engineering team will prepare the required documents to provide required compliance and submit to the department of building and safety for review and approval. Core Contractors engineering staff will pursue to obtain the building permit to begin the work. We even pay the permit fee. It saves you the hassle, expense, and frustrating hours at your local building & safety office. Core Contractors staff will prepare and provide notifications to your tenants (Housing Department requirement). Furthermore, we will site measure, order and fabricate the materials needed while waiting for city and Habitability Department approvals. Core Contractors crews provide all the equipment, labor and materials required to install the retrofitting components as required by the approved design while maintaining a clean and safe work environment. Our 30 day completion commitment is the only one you’ll find. City mandated Tests, Inspections, and Observations. City Inspectors as well as required 3rd party oversight deputy inspections are included in your base price and are coordinated by our construction staff. These costs are significant. 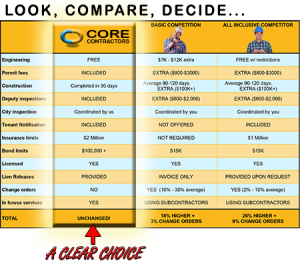 With Core Contractors, you’re covered! A certificate of occupancy must be recorded demonstrating full compliance with the Wood Frame Soft-Story Seismic Retrofit Program. Core Contractors will provide you with all the required documents showing full compliance so you can obtain your own notice quickly. As you can see, the level of services we provide with a guaranteed lowest price and available financing makes us the most valued service and the best choice available. Please contact us for a no obligation free estimate to begin the process.